San Francisco: Kayak, 1968. 8vo (16.2 cm, 6.4"). , 79,  pp. ; illus. [with the same author's] Crisis. Menomie, WI: Ox Head Press, 1969. 16mo (16.2 cm, 6.4'). pp. ; illus. Two interesting literary, small-press printed items, with excellent accompanying material. 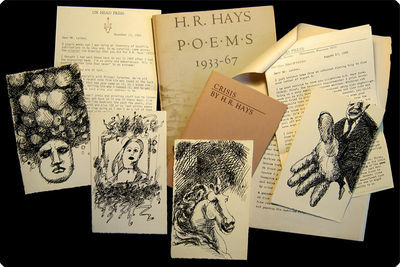 The first item is one of 1000 copies designed and printed by George Hitchcock at the Kayak Press; the second small pamphlet, illustrated by Gerson Leiber, is one of 350 copies, the edition hand-set in Goudy Oldstyle. In addition to the printed Poems and Crisis, Gerson Leiber's => four original ink drawings for Crisis — including one not printed in the piece — are here, with a cover letter (dated 1993 and apologizing for the 24-year delay in returning them! ), signed by editor and publisher Don Olsen. Also present is Hays's typescript of "Crisis," addressed to Olsen and stapled to two typed, signed letters from Olsen to Leiber regarding the artwork commission and subsequent printing details.